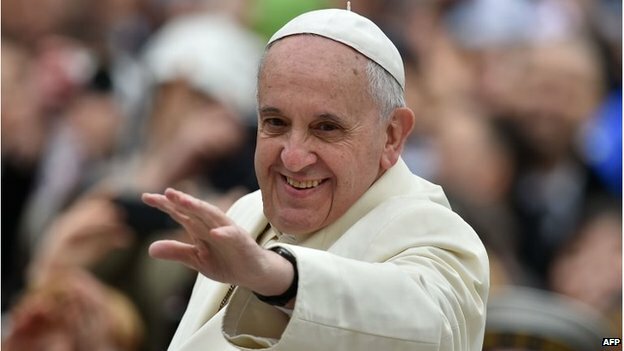 US President Barack Obama says it was a “great honour” to meet Pope Francis for the first time during a European tour dominated by the crisis in Ukraine. He flew into Rome after three days of talks with world leaders in the Netherlands and Brussels. Tensions are high following Russia’s annexation of Crimea from Ukraine. On Wednesday Mr Obama said the US and the EU were considering deeper sanctions against Moscow if there were any further incursions. Pro-Russian forces seized Crimea – which has a Russian-speaking majority – this month. Moscow annexed the peninsula after it declared independence following a referendum that Ukraine and its Western allies consider illegal. In a newspaper interview published before their meeting, Mr Obama described the Pope as a man who “lived the Christian Gospel”. US Deputy National Security Adviser Ben Rhodes said President Obama has been inspired by Pope Francis’ messages of inclusion and equality. He said Mr Obama planned to express his appreciation for his leadership. 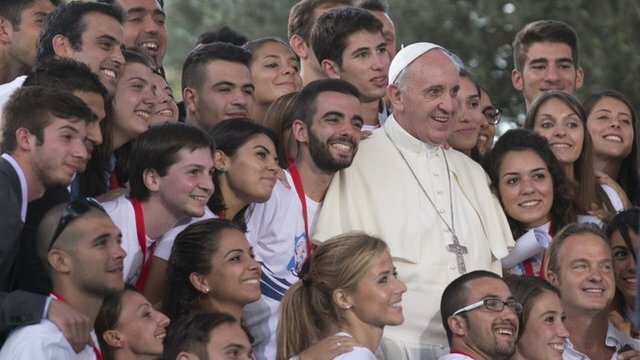 The BBC’s Alan Johnston in Rome says the two men have very different views on subjects such as abortion, contraception and gay marriage, but at this meeting they are likely to emphasise what they share. After meeting the Pope, Mr Obama is due to meet both Italian President Giorgio Napolitano and Prime Minister Matteo Renzi. President Obama is accompanied in Italy by US Secretary of State John Kerry. 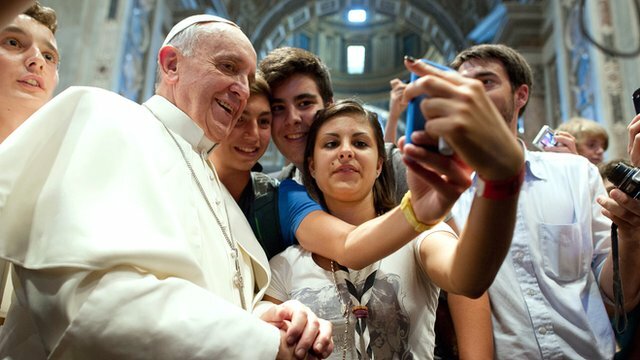 What do Americans have to say about Pope Francis? 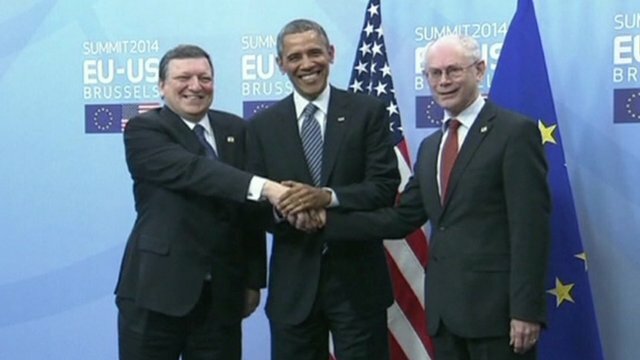 On Wednesday, Mr Obama held talks with EU leaders in Brussels. Washington and the EU have already imposed targeted sanctions against Russian and Ukrainian individuals over the annexation of Crimea. Later he said Russians would “recognise that they cannot achieve security, prosperity and status… through brute force”. “That’s why, throughout this crisis, we will combine our substantial pressure on Russia with an open door for diplomacy,” President Obama said. Pro-Russian forces began seizing key sites in Crimea days after Ukraine’s Moscow-leaning President Viktor Yanukovych was ousted. He left power following months of bloody protests over his decision to seek greater ties with Moscow rather than the EU. President Obama flew to Brussels following a nuclear security summit in the Netherlands. The Japanese and South Korean leaders have held their first official meeting following a rift over Japan’s stance on its wartime aggression in Asia. US President Barack Obama brought Japanese Prime Minister Shinzo Abe and President Park Geun-hye together at the nuclear summit in The Hague. The United States has been trying to ease tension between its two allies. Mr Obama pledged his “unwavering commitment” to them in the face of North Korea’s nuclear programme. Shortly after the meeting, North Korea test-fired what the South Korean government said appeared to be two mid-range ballistic missiles that flew about 650km (403 miles) off the North’s eastern coast. Such a launch would violate UN resolutions and be a significant step up from the shorter-range rocket launches the North has staged in recent weeks, apparently in protest at ongoing joint US-South Korean military drills. “Close co-ordination between our three countries has succeeded in changing the game with North Korea,” Mr Obama said. 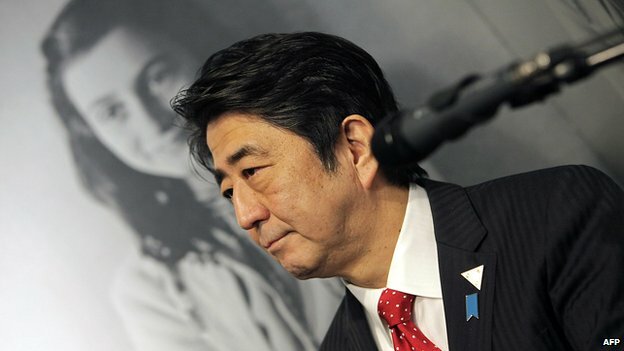 President Park had refused to meet Mr Abe over allegations that he is trying to whitewash Japanese war crimes. “We consider this meeting the first step in future co-operation between Japan and South Korea,” said Mr Abe after arriving in The Hague. He said he would also like to hold a first meeting with the Chinese leader, Xi Jinping. Japan and China are locked in a more serious confrontation in the East China Sea, where China has been challenging Japanese sovereignty and control over the uninhabited Senkaku or Diaoyu Islands. Mr Abe’s government had infuriated South Koreans and others by announcing a review of Japan’s historic apology for its sexual enslavement of Asian women during World War Two. He has since backtracked, saying that the 1993 Kono statement, which acknowledged the role of the imperial army in the forced recruitment of Asian women, would stand. Diplomats say the decision followed pressure from the US, which also criticised Mr Abe’s visit late last year to the Yasukuni war shrine, which is seen as a symbol of Japanese militarism. The US has been frustrated by the wrangling between its two north-east Asian allies at a time of growing fears about stability in North Korea, and the missile and potential nuclear threat posed by its armed forces. South Korea and China have accused Mr Abe of stirring up nationalist sentiment in Japan at a time of rising tension in northeast Asia. Mr Abe has said he wants to restore Japanese pride and self-confidence. He has also announced plans to strengthen Japan’s defence posture against the rising power of China. The Hague, Netherlands (CNN) — President Barack Obama and other world leaders have decided to end Russia’s role in the group of leading industrialized nations, the White House said Monday. The move to suspend Russia’s membership in the G8 is the latest direct response from major countries allied against Russia’s annexation of Crimea. “International law prohibits the acquisition of part or all of another state’s territory through coercion or force,” the statement said. “To do so violates the principles upon which the international system is built. We condemn the illegal referendum held in Crimea in violation of Ukraine’s constitution. Russian Foreign Minister Sergey Lavrov said earlier in the day that being kicked out of G8 would be no big deal. In a nod to political and economic reforms, the United States, Britain, Canada, France, Germany, Japan, and Italy added Russia to their group in 1998 — transforming it from the G7 to the G8. An aide to British Prime Minister David Cameron confirmed to CNN that a group summit initially planned for June in Sochi, Russia, where the Winter Olympics were just held, is now off. The United States and its allies in Europe are “united in imposing a cost on Russia for its actions so far,” Obama said earlier in the Netherlands where he attended a nuclear security summit with other world leaders. Western powers have imposed sanctions and other penalties against specific people in Russia close to President Vladimir Putin. A senior Obama administration official, not speaking for full attribution, said Obama and other leaders agreed that further steps to punish Russian President Vladimir Putin could include sanctions on energy, banking and defense sectors — all areas where Europe is deeply engaged economically with Russia. Those additional sanctions could be prompted if Russia further escalates its incursion into Ukraine, which the official defined as sending troops beyond Crimea into the southern or eastern parts of the country. Violence in the contested peninsula could also trigger further sanctions. While the official said further penetration of Ukraine by Russian troops remains the most immediate source of concern for the United States, other potential land grabs also worry the United States and its allies. NATO has expressed concern Russia could attempt to reclaim a region of Moldova with Russian sympathies. Obama has said a military incursion in Ukraine is off the table, and his advisers are hesitant to even frame the crisis in Ukraine as a bad ’80s flashback — Obama in one corner, Putin in the other. It’s not “Rocky IV,” as Secretary of State John Kerry said. White House officials don’t care to publicly muse about Putin’s intentions. National Security Adviser Susan Rice said the Russian President’s actions speak for themselves. Asked whether the United States will provide military aid to Ukraine’s woefully underfunded armed forces, administration officials cautioned that such assistance could inflame tensions. Lavrov met with Kerry on Monday and said Russia’s action in Crimea was necessary. While Democratic and Republican lawmakers in the United States are stepping up their calls to provide Ukraine with light arms and other military aid, administration officials have argued that sanctions put in place so far must be given time to take hold. With an estimated 20,000 Russian troops on Ukraine’s border, the question is whether Obama’s use of soft power will deter Putin. With little resistance, the Russian President could easily move into eastern Ukraine even as Obama seeks to isolate Moscow in meetings with European allies. It’s a possibility not lost on senior administration officials. House Intelligence Committee Chairman Mike Rogers, a Michigan Republican, argued the Russian leader is likely eying more opportunities in the coming days. There are other approaches. Obama’s former ambassador to Russia, Michael McFaul, urged the administration to intensify its policy of isolating Putin. “Mr. Putin’s Russia has no real allies. We must keep it that way,” McFaul wrote in an op-ed in the New York Times. (CNN) — Western powers slapped sanctions on more than two dozen Russian officials and their allies in Ukraine’s Crimea region on Monday, while Ukrainian officials vowed they would never accept the territory’s annexation by Russia. In a televised address Monday night, interim Ukrainian President Oleksandr Turchynov said his government would do “everything possible” to solve the crisis diplomatically, and he praised his citizens for refusing to respond to Russian provocations with violence. But he announced a partial mobilization of his country’s armed forces and said Ukrainians “have to unite in one big family, which is ready to protect its home.” Prime Minister Arseniy Yatsenyuk said there was “a strong possibility” of a Russian invasion of Ukraine. The Russian-backed breakaway government in Crimea applied to join with Moscow on Monday after a weekend referendum that Ukraine, the United States and the European Union called illegal. U.S. and EU officials announced sanctions on more than two dozen Russian officials and their allies in the region, which Russian-backed forces seized three weeks ago. In Moscow, Russian President Vladimir Putin signed a decree that recognizes the independence and sovereignty of the Republic of Crimea, says a statement on Russia’s Kremlin website. The Russian parliament is expected to vote on whether to annex the breakaway territory in the coming days. The EU sanctions include the top pro-Russian Crimean secessionist leaders, 10 leading Russian lawmakers who have endorsed the annexation of Crimea and three top Russian military commanders. The U.S. sanctions list also includes two top advisers to Russian President Vladimir Putin and ex-Ukrainian President Yanukovych, whose February ouster in the face of widespread anti-government protests sparked the current crisis. “The international community will continue to stand together to oppose any violations of Ukrainian sovereignty and territorial integrity, and continued Russia military intervention in Ukraine will only deepen Russia’s diplomatic isolation and exact a greater toll on the Russia economy,” he said. Washington said its sanctions targeted Russian officials and lawmakers, as well as Crimea-based separatist leaders, with financial sanctions for undermining “democratic processes and institutions in Ukraine.” Obama’s order freezes any assets in the United States and bans travel for the 11 people named. Among those sanctioned were ousted Ukrainian President Viktor Yanukovych and aides to Putin. But one of the Putin aides named in the U.S. sanctions called it “a great honor” to be singled out for American punishment. “I consider the decision of the Washington administration as a recognition of my service to Russia,” Vladislav Surkov told Russian news outlet MK. And in Brussels, Belgium, European Union international policy chief Catherine Ashton announced sanctions against 21 people “responsible for actions which undermine or threaten the territorial integrity, sovereignty and independence of Ukraine.” She called the weekend vote “illegal” and “a clear breach of the Ukrainian Constitution,” and she urged Russia not to follow up by annexing the territory. “We want to underline very clearly that there is still time to avoid a negative spiral and to reverse current developments,” she said. More measures are expected to follow in a few days, when EU leaders meet for a summit in Brussels, Lithuanian Foreign Affairs Minister Linas Linkevicius wrote in a message on Twitter. Diplomatically, Sunday’s referendum has put the United States and Russia on the kind of collision course not seen since the Cold War. Economically, it’s unclear how much such a coupling will cost Russia. Crimea is home to 2 million people, most of them ethnic Russian. Moscow strongly backed Sunday’s referendum, which the region’s leaders declared won with an overwhelming 96.7% vote in favor of leaving Ukraine. Russian lawmakers have said they will welcome Crimea with open arms, but members of the ethnic Ukrainian and Muslim Tatar minorities had said they would boycott the vote. Many Crimeans hope the union with Russia will bring better pay and make them citizens of a country capable of asserting itself on the world stage. Others saw the referendum as a land grab by the Kremlin from Ukraine, whose new rulers want to move the country toward the European Union and away from Moscow’s sway. Yatsenyuk said Moscow appeared ready to attempt a similar play in other Russian-speaking areas of Ukraine, starting with demonstrations by what he called “political tourists” with foreign passports. Earlier, Yatsenyuk threatened dire consequences for the Crimean politicians who had called the vote, threatening to try them in Ukrainian and international courts. Defense Minister Ihor Tenyukh reported Sunday that Ukrainian troops and equipment are being moved to the east and south after a weekend Russian incursion into the town of Strilkove, northeast of Crimea. About 60 Russian troops took part in the operation, which the Russians said was needed to prevent a possible terrorist attack on oil assets, according to Ukrainian border guards. The area supplies electricity, fresh water and natural gas to the Crimean Peninsula. • On Monday, Russia proposed creating an international support group to mediate in the Ukraine crisis. Its Foreign Ministry said in a statement that this group would urge Ukraine to implement portions of a February 21 peace deal and formulate a new constitution that would include Russian as an official language alongside Ukrainian, as well as set out broad powers for the country’s regions. • Putin will address a joint session of Russia’s parliament to speak about Crimea on Tuesday. • Crimean lawmakers have approved legislation to make the Russian ruble the official currency in Crimea alongside the Ukrainian hryvnia, according to a statement posted on the Crimean Parliament’s website. The hryvnia remains an official currency until January 1, 2016. The statement did not provide a date for when the ruble would be circulated in the region. • The lawmakers also adopted a resolution stating that on March 30, Crimea will move to Moscow Standard Time. • A secession would mean transferring banks, public utilities and public transport from Ukraine to Russia in what would undoubtedly be a costly operation. Crimea is entirely integrated into Ukraine’s mainland economy and infrastructure: Ninety percent of its water, 80% of its electricity and roughly 65% of its gas comes from the rest of country. It also depends heavily on the Ukrainian mainland to balance its books. About 70% of Crimea’s $1.2 billion budget comes directly from Kiev. • A special tax system may be introduced for Crimea, Russia’s state-run ITAR-Tass news agency reported Monday, citing Russian Finance Minister Sergei Shatalov.